I spent yesterday morning across town at the physics lab I'll be doing the optical tweezers work in, getting my hands on the equipment I'll be using. One of the many things I learned is that I need to work out the practicalities of bringing together (1) cells that are stuck onto a cover slip and (2) DNA-coated beads. I won't be using a flow-through chamber, at least not initially, but I think I have a plan that will work both for the initial troubleshooting under our own microscope and with the optical tweezers apparatus. 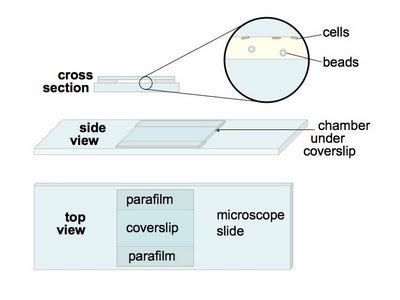 The chamber I'll be using is constructed by sandwiching two strips of Parafilm (thin wax) between a glass microscope slide and a glass coverslip, and then briefly heating the slide to melt the wax so it forms a tight seal along both sides of the coverslip. This creates a chamber that's about 2 cm long by 1 cm wide and about 100 nm high, open at both ends. 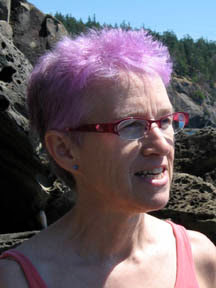 The chamber holds about 20 µl of liquid. (Hang on, is that volume consistent with those dimensions? 1 cubic cm is 1 ml, and 100 nm is 1/100 of a cm, so yes.) Once the chamber is filled its ends are sealed with melted wax or clear nail polish. Here's my plan. I'll first create a chamber using a coated coverslip (coating down). I'll then introduce some competent cells (in MIV) by pipeting 20 µl onto one edge (say the left edge) of the chamber. Capillary action draws this liquid into the chamber. After a few minutes I'll pipette a larger volume of BSA (in MIV) at the other end of the chamber while placing a tissue at the left edge to draw liquid out. This will create a flow of BSA solution that displaces the cell solution. I'll continue to do this until all the free cells have been washed out of the chamber, and all of the reactive poly-L-lysine has been neutralized by the BSA. Then I'll pipette the beads (in MIV) into the chamber, drawing out the unwanted BSA solution on the other side. And finally I'll dry the edges and seal the ends. One nice feature is that I should be able to trouble shoot all of this in our own lab with our own microscope. So I can find out what concentration of cells to use, how long to allow for attachment, how much BSA to use, how much washing to get rid of the unattached cells, and how many beads to use. The final test will be whether the DNA-coated beads attach to the cells (at room temperature) but uncoated beads don't. Once I have all this working, it will be time to go back to the optical tweezers apparatus!